Earlier this week Blizzard held the For Azeroth! Event in which you could earn an in game mount for both Heroes of the Storm and World of Warcraft. The event was either popular enough, or the time frame so narrow they got complaints, that they have extended the event from March 17th to Sunday, March 26th. Interested in joining or finishing up from before? The details are simple. Group up with a friend and play 15 matches in Heroes of the storm as a Warcraft Hero, The hero your buddy chooses doesn’t matter as long as you are playing as one you will earn progress towards the rewards. 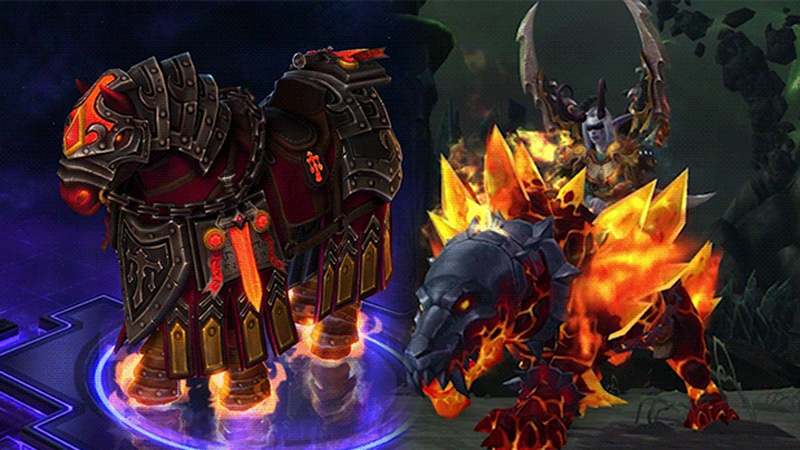 Once done you will earn the Flames of Judgement Charger Mount​​ and a 10-day Stimpack for Heroes of the Storm, and the Primal Flamesaber Mount in WoW. ; All and all it isn’t that time consuming of an event, so if you like the look of the mounts pictured above hop on and wrap it up real fast. Don’t play HotS but want the Flamesaber in Warcraft? Heroes of the Storm is free to play and has a free champion rotation that includes heroes from Warcraft, so you can hop in and find a group in chat, complete the matches and reap the rewards. Its a participation Reward after all so if you aren’t the best you can still get the benefits without necessarily scoring a win in every, or any match… And if you haven’t played any MOBA at all before just remember, if you aren’t doing well its probably Lag anyway.